These small primates have grayish/brown fur that is lighter on the limbs and trunk. Oversized ears are used to maintain contact with peers and detect predators. Huge eyes are surrounded by dark fur. 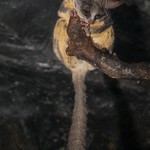 Moholi bushbabies' long tails are used for balance as they scamper through the trees. Back legs, which are longer than the front legs, are ideal for vertical climbing and leaping. Stable. 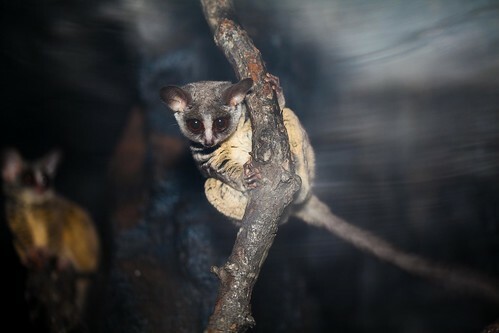 Lincoln Park Zoo cooperatively manages Moholi bushbaby populations with other institutions in the Association of Zoos and Aquariums. 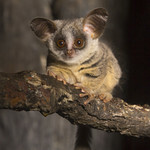 Moholi bushbabies occupy woodlands, forests and the edges of such wooded areas, spending time at all levels of the forest. 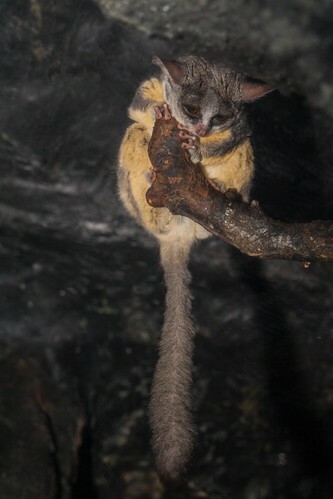 Stable Moholi bushbabies live in small family groups. Females and their young form the core of these social groups. Juvenile males leave their natal group to find a new group. They are nocturnal creatures, spending much of the day sleeping. 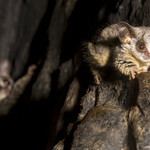 They aggressively defend their territory from other bushbabies. They are preyed on by large birds, snakes, mongooses, civets and genets. They protect themselves from predation by nesting in tree holes, mobbing up to use numbers to their advantage and being active at night. 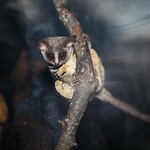 Moholi bushbabies have a polygynous mating system in which dominant males breed females within surrounding territories. There are two mating seasons each year, resulting in winter and fall births. Females build nests or take over abandoned bird nests in which to birth and rear offspring. Young, born with fur and open eyes, are weaned after three months when they begin catching insects. They reach sexual maturity at 10 months. They also communicate non-verbally with "urine washing," in which they douse their hands and feet and mark their territory. 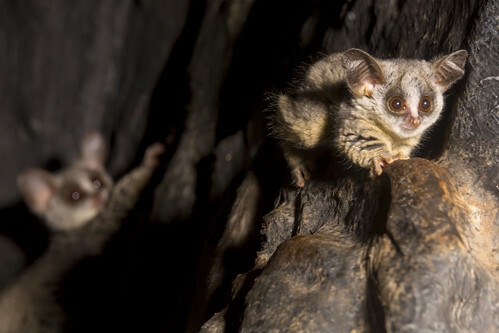 | Moholi bushbabies will allogroom within the family to reinforce social bonds. 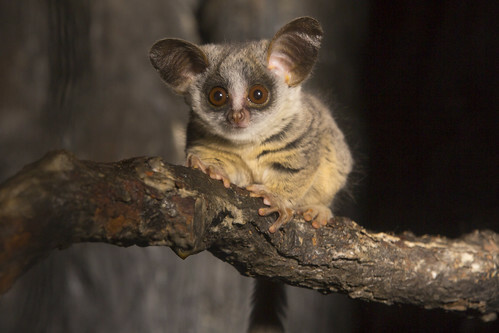 | Moholi bushbabies use loud calls to communicate over long distances. When threatened by a predator, they will mob up to defend themselves.